Tukwila police officers beat, tased and pepper-sprayed brothers Jahmez Amili and Charles Chappelle during an arrest on May 12, 2012. In April, they were paid $425,000 to settle their civil-rights claim against the city. 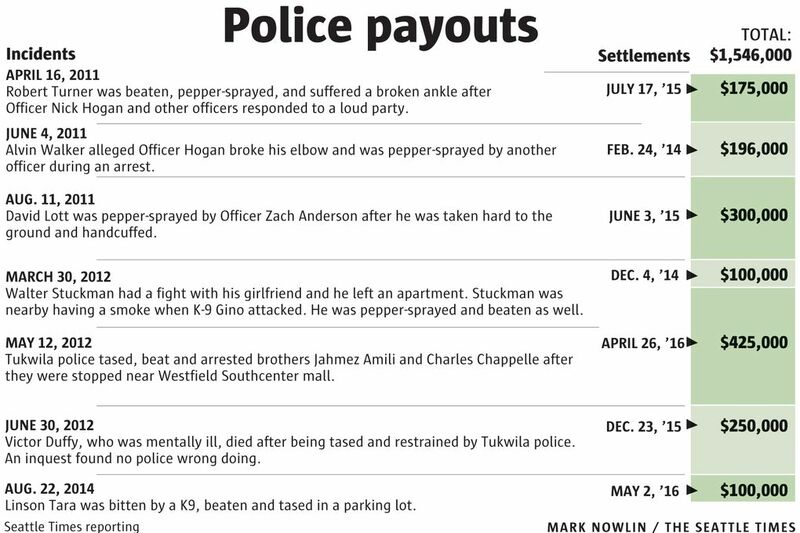 Federal court records show the city of Tukwila has paid out more than $1.5 million to settle six civil-rights lawsuits against police officers since 2014, mostly involving allegations of excessive use of force. Brothers Jahmez Amili and Charles Chappelle said “no” to a Tukwila police officer who tried to stop them walking near Westfield Southcenter mall early on May 12, 2012. For their defiance, they were beaten, tased, pepper-sprayed and jailed. In April, they were paid $425,000 to settle their civil-rights claim against the city after a federal judge found the officer had no reason to stop them in the first place. That settlement came within a week of the payment of $100,000 to Linson Tara, a man who was repeatedly punched, tased and bitten by a police dog during his arrest by Tukwila officers in 2014. The city agreed to pay Tara’s attorneys’ fees as well. And the Tukwila Police Department was where Officer Nick Hogan was working in 2011 when he pepper-sprayed a prisoner restrained hand-and-foot on a gurney at Harborview Medical Center. Hogan, now an officer in Snoqualmie, was recently indicted by a federal grand jury for that incident, becoming the first police officer accused of a criminal civil-rights violation in Western Washington in eight years. Federal court records show that Tukwila — which has a police department of 79 sworn officers, a population of about 20,000 people and a major retail center in Southcenter mall — has paid out more than $1.5 million to settle seven civil-rights lawsuits against officers since 2014, mostly involving allegations of excessive use of force during arrests. By comparison, Seattle — with 1,200 sworn officers serving a population of more than 650,000 — paid out $3.3 million to settle 25 claims since 2014, according to the Seattle City Attorney’s Office. However, nearly $2 million of that amount came from a single case, a 2009 police shooting that led to the largest settlement in Seattle’s history. “The sheer number of these cases for a city that size is staggering,” said Seattle lawyer Lee Rousso, who represented the family of Victor Duffy, who died while struggling with Tukwila officers on June 30, 2012. The city settled a lawsuit by Duffy’s family for $250,000 last year. A search of federal-court dockets for lawsuits against police departments in cities of similar size in Western Washington turned up several lawsuits over allegations of police civil-rights violations, but none with multiple six-figure settlements since 2014. Tukwila Police Chief Mike Villa and Mayor Allen Ekberg reject any notion that the settlements reflect flaws in the department’s training, or interactions with criminal suspects, although the city has reviewed and changed policies as a result of the lawsuits. In each instance, Villa said, an internal review showed his officers were justified and that the force used was reasonable and necessary. The cases, he said, are defended by lawyers hired by the Washington Cities Insurance Authority, an insurance pool made up of more than 160 Washington municipalities. The authority’s executive director, Ann Bennett, said it is the claims adjusters — not the police — who decide which lawsuits to settle, and for how much, but only after the adjusters and the lawyers assess the city’s exposure to liability. The federal judge who presided over three of the recently settled lawsuits filed against Tukwila officers has questioned the constitutionality of the department’s policies regarding the use of pepper spray and its officers’ understanding of when they can stop and detain someone. Villa said Tukwila modified its policy regarding the use of pepper spray after paying $300,000 last year to David Lott, a 60-year-old man who was arrested, handcuffed and pepper-sprayed while restrained by two Tukwila officers at a bus stop. Dash cam footage shows Tukwila police allegedly using excessive force in the 2011 arrest of 60-year-old David Earl Lott. An officer pepper sprays Lott around the one-minute mark of this abridged footage. Video courtesy of MacDonald Hoague & Bayless. Lott’s case settled at trial after U.S. District Judge John Coughenour started questioning a Tukwila assistant chief on the witness stand about the possibility of issuing an injunction against the department, which at the time classified use of the powerful irritant in the lowest category of force. Villa, who was hired as chief in 2011, said the department was also reviewing how it deploys police dogs after the Linson Tara settlement. That lawsuit settled before any motions were filed — rare in federal civil-rights lawsuits — likely due in part to the disturbing dash-camera video of the arrest. Tara, who was intoxicated, is seen being repeatedly punched in the face, tased and then bitten by a police dog as officers tried to arrest him for trespassing in a freight-yard parking lot. The chief defended the officers’ actions, but agreed the video was difficult to watch. Ekberg acknowledged he was disturbed by the video. “I found it incredulous,” he said. Some of the lawsuits alleged there was a racial component in their encounters with Tukwila police. A lawsuit filed by Robert Turner, a black man, after his ankle was broken during a 2011 violent arrest by ex-Officer Hogan alleged that the officer commented: “This one isn’t going to play basketball anymore.” That suit resulted in a $175,000 settlement. Chappelle and Amili alleged in their suit that one of the reasons they were stopped by police near Southcenter mall is because they are black. Their suit also relied on graphic police dashcam video, which shows the two men being taken to the ground by officers and repeatedly punched. While it is the most recent case to settle, it had been in federal court for three years and was the most hard-fought of any of the lawsuits. Chappelle, 34, and Amili, 28, were walking along the 61st Avenue overpass over Interstate 405 about 2:45 a.m., heading to their mother’s house a few blocks away. They were seen by Officer Zachary Anderson, who was responding to a report of a fight on a party bus in the Southcenter mall parking lot. Anderson decided to stop and question them. Anderson told the men he was investigating a fight nearby and asked them to come to his car, stating they “weren’t free to leave,” according to court documents. There is no dispute that the men kept walking, used foul language and told the officer they hadn’t done anything. Anderson responded by pulling his Taser, ordering them to stop and telling them they were under arrest for obstructing a public servant. The dash-camera video picks up at this point, as another Tukwila officer rounds a corner onto the bridge and the men and officers are in the headlights. Chappelle stands with his hands over his head as the officers approach and roughly take him and his brother to the ground, where they were tased, dosed with pepper spray, kicked and beaten. At one point, a clearly stunned Amili is laid across the patrol-car hood; his bloodied face is plainly seen. Both men were taken to a hospital for treatment after the jail refused to take them because of their injuries. They were eventually booked and spent several days in jail on charges of obstruction, resisting arrest and assault on a police officer. Tukwila argued the men were suspicious and that their refusal to obey Anderson justified his actions. The city said the decision by the men to keep walking away from the officer amounted to flight. “While police, no less than anyone else, may resent having obscene words and gestures directed at them, they may not exercise the awesome power at their disposal to punish individuals for conduct that is not merely lawful, but protected by the First Amendment,” he wrote. The city’s attorneys appealed the judge’s ruling but dropped the appeal without explanation, and the case settled. Villa does not believe anything should be read into the settlements, saying the department and its officers are rarely consulted beforehand and have little say in the outcomes. Villa and Ekberg strongly defend the Tukwila department but say there is always room for improvement. Recently, the city subscribed to Lexipol, a police risk-management tool that provides model policies and guidance on the most up-to-date case law and trends. The mayor said the city is about to start a body-camera trial program, fitting five officers with the devices. Ekberg, who was a city councilman before being elected mayor last year, said he canvassed the city three times while campaigning and never heard any complaints about the police use of force. Mike Carter: mcarter@seattletimes.com or 206-464-3706 Information from Seattle Times archives is included in this story.